Mary is in excruciating pain. Waking up and stepping out of bed has become a dreaded activity. She remembers the days she would bolt out of bed and head out for a quick run before getting her children on the bus and herself off to work. Mary is an avid digital reader. She’s is online nearly everyday and has investigated many different options for alleviating her knee pain. She has tried various injections, physical therapy, braces and she even gave in and used a cane for a while. For many years she was able to keep the pain under control, but those days are over. She now feels that her quality of life is very poor. She dreads having to go upstairs, and tries to push off having to go to the supermarket. When at the supermarket she needs to use the cart as a walker of sorts. She’s committed to moving forward with the knee replacment her doctor had recommended months ago. Mary went straight to Google to read everything she could about knee replacements. Most of what she read was commercialized nonsense, but a few articles caught her eye. She understood having a properly sized knee joint put in was critical — it was clear that an over-sized component can cause long term pain. She also understood that different designs were on the market — but wasn’t certain it made a difference. It turns out that design can matter… but we’re not quite sure how much. Then Mary read about a custom (Conformis) knee replacement. A custom knee replacement is actually manufactured specifically to fit her knee and no one else. She found this interesting because it takes sizing issues out of the equation. She also understood that by precisely matching the shape of her own anatomy this would minimizes the risk of her knee feeling unstable or loose after it was put in. Mary was convinced that a custom knee replacement would be her chosen option. She understood that the risks of infections, blood clots, stiffness and other complications could arise — but she was now left with few other options other than letting her knee pain completely control her life. Mary is not the only patient who might benefit from a custom knee replacement. 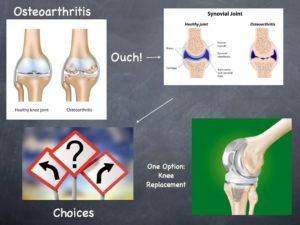 Research will eventually tell us whether or not this should be the mainstream treatment for all knee replacement patients … for now, it is available for those who ask. I have bone on bone in my right knee and need a replacement. I have tried the jels with little relief. Is there a material such as a silicon pad etc. that could be placed between the two bones to replace the cartiladge? I wish there was Jim. I’ve been reading your blog and about you, and hoping you might be able to offer me some advice. I was told today that the arthroscopic knee surgery I had in December (including the repair of two menisci tears, and pattellar sublimation) has been unsuccessful. I have the same issues in my other knee, and the doctor has suggested that I try Synvisic injections, but he suspects I will need both knees replaced. As a 39 year old woman, with Fibromyalgia, Osteoarthritis, Psoriatic Arthritis, and a number of other painful conditions. I am concerned with getting this right. Is there a certain type of prosthesis or brand which I should be looking into. I have Medicaid, so I may not have many options, but I want to be as educated and successful as possible. Thank you for your time. 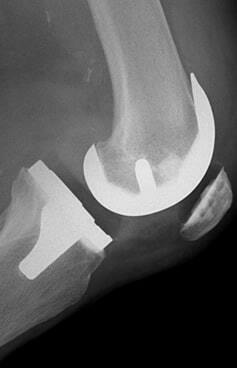 The type of prosthesis used for a knee replacement is far less important then the surgeon performing the procedure. The most expensive implant placed improperly will result in a poor result. The older implants did very very well for quite a while as long as they were put in correctly. Find someone who performs 50-100 knees per year … but not more than 300 (yes, too many is probably bad too) and you should be in good hands. This is far more of an emotional, psychological and physical issue then it is implant related. Hope that makes sense.